The eighth installment of the Big Fun Festival is upon us and promises bigger fun than ever before. 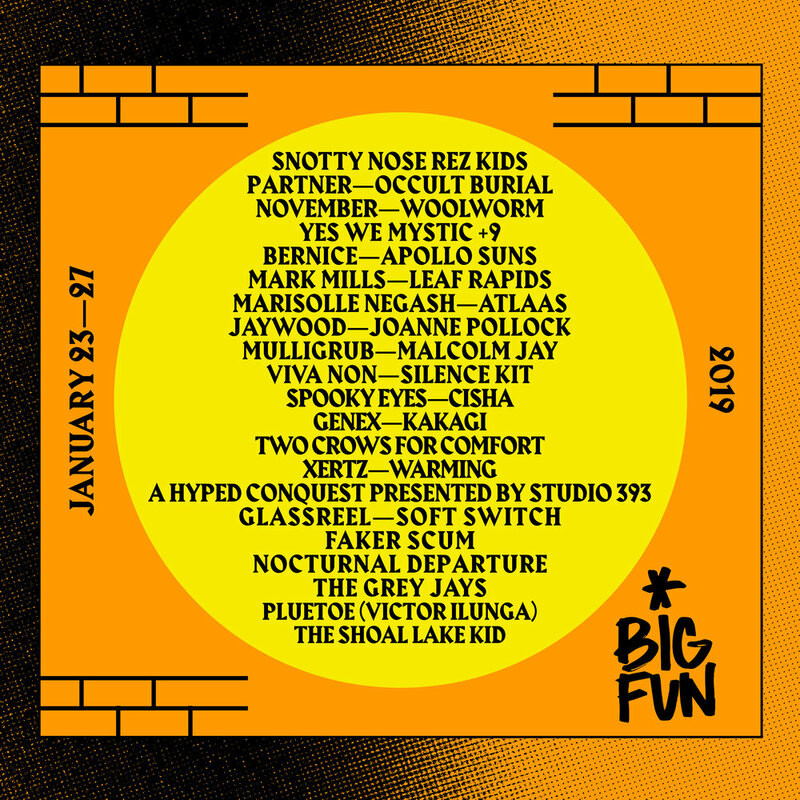 The 2019 year runs from January 23 –27 and features over 30 local and out of town acts including BC’s Snotty Nose Rez Kids, Atlantic queer lo-fi garage group Partner, Montreal’s electronic soul balladeer NOVEMBER, local art pop favourites Yes We Mystic, and Ottawa’s black metal outfit Occult Burial.This year will also include a multi-disciplinary collaboration that explores the cross-sections between the mediums of music and film featuring musician Marisolle Negash and visual performance artist Plutoe (aka Victor Ilunga). Genres range from folk and pop to punk, hip hop, rock and experimental audio/visual collaborations and are hosted in various venues throughout Winnipeg’s downtown. These include Winnipeg favorites The Handsome Daughter, The Good Will Social Club, and The Times Change’d, as well as new to the festival venues, Westminster United Church, Grey Owl and The Forks. This year, we are again partnering with Manitoba Music’s January Music Meeting which brings industry experts from across the country to host panels and discussions with Manitoba artists.